rediff.com: Will Nepal ever be the same? Will Nepal ever be the same? 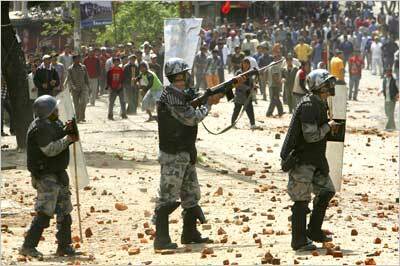 On Thursday, tens of thousands of Nepalis defied a curfew in protest. It was the largest show of discontent with King Gyanendra since demonstrations against his dictatorship began more than two weeks ago. There were nearly two dozen demonstrations around the capital city, Kathmandu, ranged from festive rallies to angry riots. Some even demanded the death of the king. Security forces responded by fatally shooting three protesters.